The wireless handswitch allows remote start/stop of the Polaris timer as well as controlling a few other event-specific features. When used with our Speed Training system, the handswitch can be used to manually start or stop the timer, or to control arming of the timer to give the coach more control over timer activity in crowded situations. For dog agility trials, the remote handswitch can be be used to manually start or stop the timer for gaming classes. 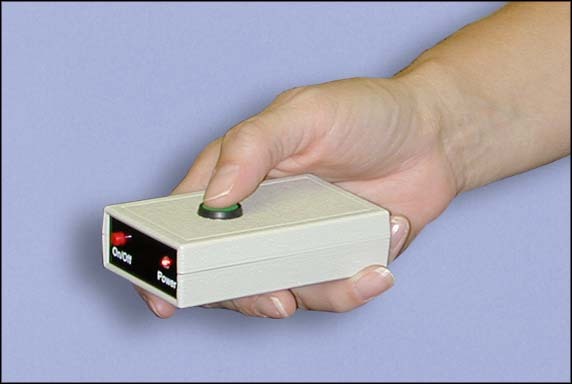 The handswitch can also be used to control the "table timer" countdown. This is an automated table count with an accurate cadence that is spoken through the optional amplified speaker. The wireless handswitch can be used to remotely start and/or stop the timer instead of using the start/stop	button on the Polaris console. The wireless handswitch for ranch sorting is used by the pen judge to mark the time that each cow is sorted.